Very promising idea – do you have a copy of Co-movements of sector index returns in the world’s major stock markets in bull and bear markets: Portfolio diversification implications to share? Why do you have for some sectors Not Three components? Email me at quantumfinancier at gmail dot com for the paper. Then regarding your question, some sectors are simply not loaded in the component. You can think of it as them not being a factor for the PC. I’m not sure what the results would look like… But combining pca with regression (partial least squares regression) might be interesting. Good question, I have not tried it yet, but I think it would be an interesting avenue to explore. I’ll touch it in another post if the results are interesting. Quick question. In your regression analysis, did you use all the ETFs as regressors simultaneously? They are very likely to be highly correlated and thus the regression would be severely affected. 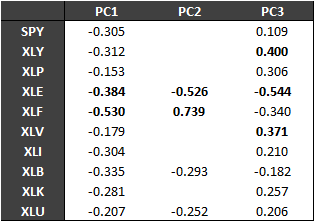 A more sound approach would be to use orthogonal regression (regression of returns on the PCA factors’ realizations). Good point, multi-collinearity would affect the regression but I ran them individually first and it did not notice any major changes in the coefficient significance and the direction. Very nice post. I think the next step would be VAR which could include lags beyond 1. However, potential problems include not just the time varying nature of sector performance versus the index, i.e. bull versus bear market, but also the varying composition and weighting of the index and the sectors over time. Due to the difficulty of quantifying or adjusting for the latter, it seems you pretty much have to ignore it. Ideally, you’d like to catch the time-varying aspect of sector performance, given that is what you are seeking, right? Thoughts? Thanks, I think the VAR approach has some problems with it that will make it cumbersome to use. However, if we decide to sacrifice the time-varying aspect and the regime we miss on some very important information. Orthogonal regression as suggested by Alexandre would be a good idea and I think I will try it out soon and post the results. I think that sacrificing the timing of prediction performance is a big problem since it is precisely what we are trying to do. Having a regime switching model for the prediction could also be a good approach. I’ll give it some thoughts and come back to it.